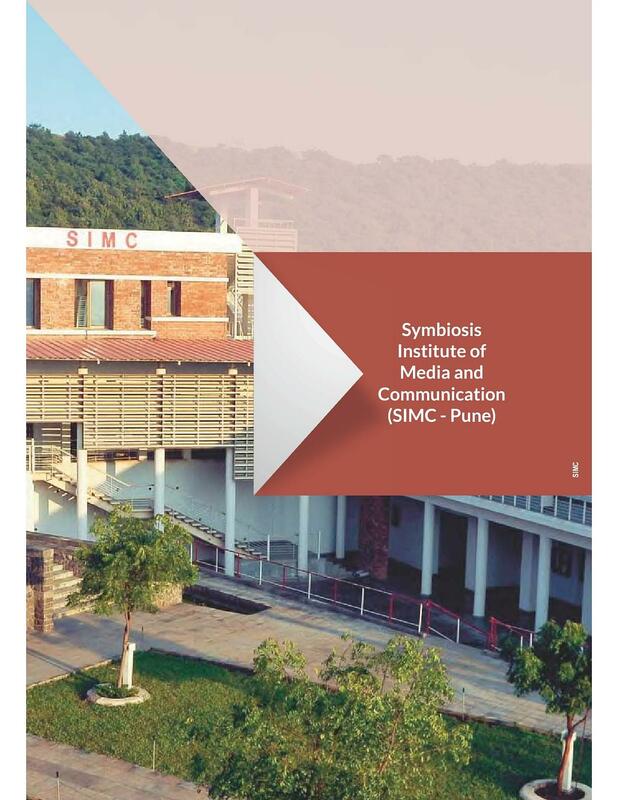 Symbiosis Institute of Media and Communication popularly known as SIMC is the premier institute for pure-play Media & Communication which nurtures talents in the area of producing media content and developing future leaders for managing creative businesses. Symbiosis Institute of Media and Communication will be the preferred destination for all who aspire to excel in the field of Media and Communication Management. Enabled with technologically advanced systems, high internet band-width and the latest software the computer lab is fully equipped to fulfill every need of the students. It consists of 80 Dell powered, internet enables work stations with 15’ flat screens where students are provided with individual personal server space for work. Studios which are fully equipped shooting floor with a multi camera set-up. 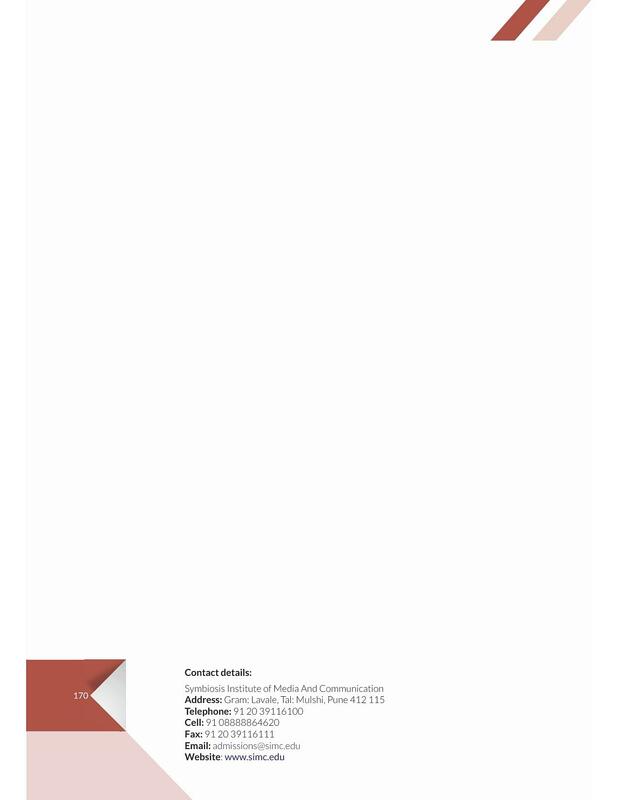 It has all the equipment required to meet contemporary production standard. Some of the standard instruments are a Teleprompter Pro System, microphones like Azden SGM 2X and Sony ECM 77B along with Audio Visual Equipment’s like the Panasonic Handicams and DVX-102. It is a good experience which provides holistic learning. I have had a wonderful experience, with loads of learning, new friends etc. There were issues around placements and managements handling them but eventually it turned out fine for a lot of the classmates one way or the other. Wish there was a Time-Machine. I feel that every institute evolves with time. The course content, curriculum should be in sync with what the students are actually going to face in the market. 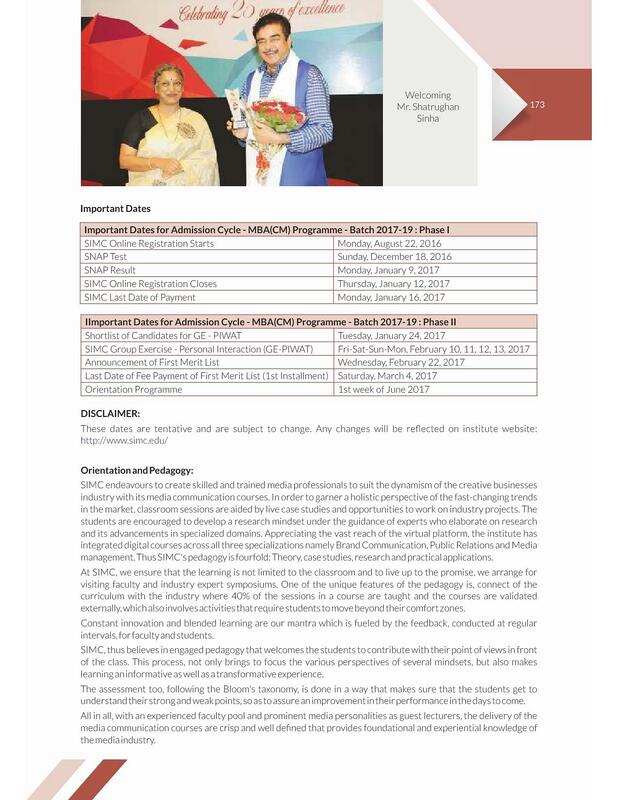 Also the program need to have futuristic vision while ensuring that the capability of the students to visualise their careers 5-10 years down the line is improved and clear. The college keeps you stressed out, but pushes you to give in your best. 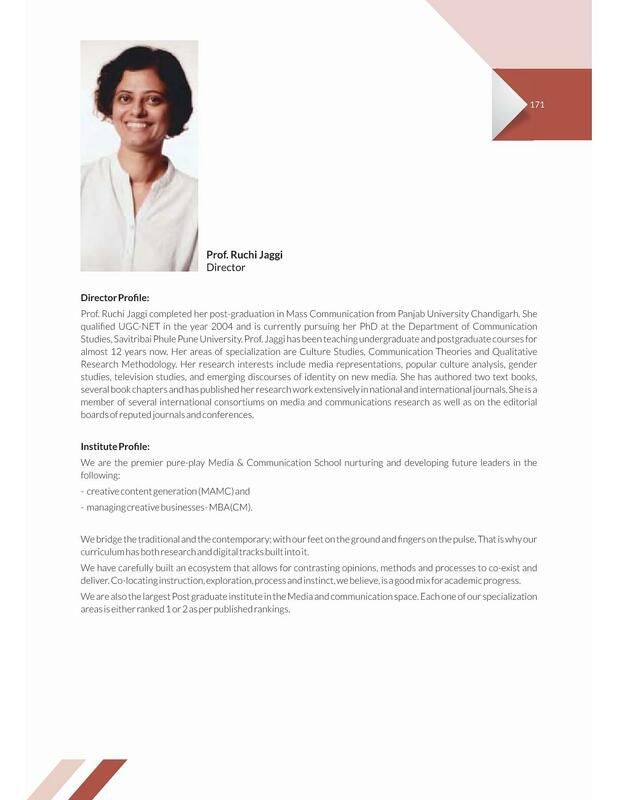 The professors are very approachable and the director is the best. I have taken SNAP exam in 2008. I have scored 52 marks in SNAP then in second round I have completed Group discussion, Personal Interview and 3 field assignment. Thn also couldn't get through in first list but got selected in second list. 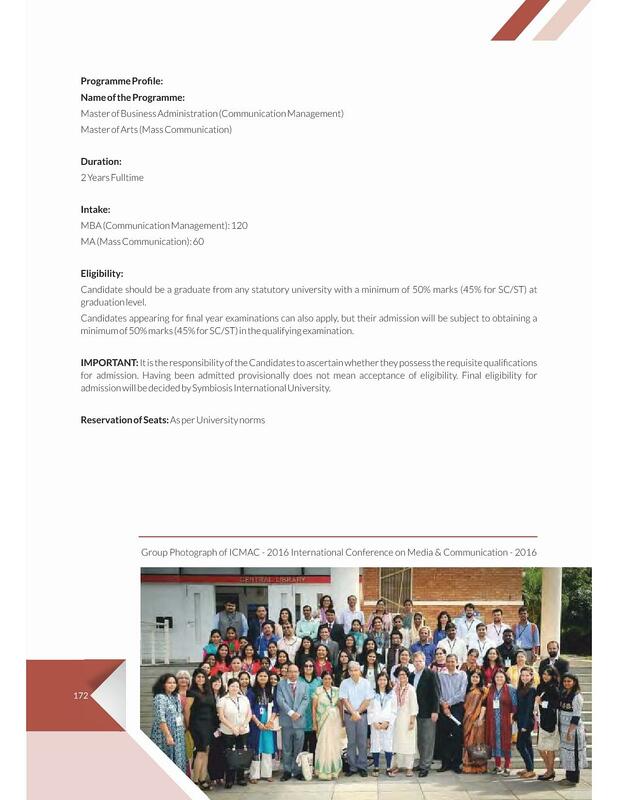 As SIMC is the Best PG institute for complete media course. And infrastructure & Facilty provided by SIMC & Symbiosis is best in the country. Symbiosis lavale campus is a Eco friendly campus. I took SNAP Common Test. I dont remember my score. I opt for this college because they were offering a course in Public relations. A separate exam called the Symbiosis Entrance Test (SET) had to be written. I scored 92 out of 150 and made it through to round 2 as the cut off was 78. SCMC is the top media college in the country and offers a brilliant filmmaking course.